I have a slight change in my portfolio management strategy that involves bonds and CDs. (1) I will be aggregating the interest income paid by my Tennessee municipal bonds and will use those funds solely to buy more of the same. Since municipal bonds have $1K par values and are sold in five bond lots, this will result in the purchase of 5 bonds annually initially, then 10 bonds annually and so on. The first $5K purchase using those proceeds will be made in the 2018 first quarter based on the current annual income number. Any unused amount in one year will be carried over into the next year, so a 10 bond purchase in 2019 will likely be possible. 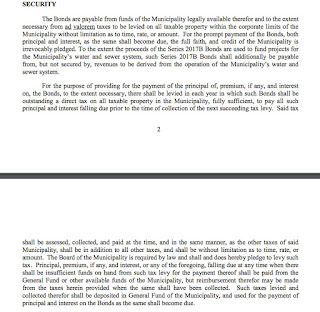 Other than the purchases made as outlined above, I will be adding to the Tennessee Municipal Bond position only when interest rates move progressively higher. For example, I would consider buying another $10K when I can acquire an AA or higher rated bond that has a current tax free yield of greater than 3.5% and another $10K when the current yield hits 4%. Given my financial situation, I do not view those bonds maturing in 2026 to 2030 as involving serious interest rate risk issues. I am assuming more interest rate risk with those bonds, compared to the lower duration corporate bonds that have been sold. A majority of maturities are in the 2034 to 2042 range. The bonds in that range will go down significantly in value with a persistent and meaningful rise in interest rates for similar duration and quality bonds. I would not be buying any of those long duration bonds if it was possible that I would be forced to sell them at an inopportune time. In exchange for more interest rate risk, I am receiving a greater after tax current yield and YTM. I have attempted to mitigate the overall portfolio interest rate risk issue by selling intermediate term corporate bonds, fixed coupon equity preferred stocks, long duration exchange traded bonds and by substantially increasing my allocation to short term CDs where I can take advantage of a rising rate period and earn much higher yields than what is is now, and likely to be available over the short term in my Fidelity and Schwab cash reserve funds. The desirability of municipal bonds could decline some in the event the GOP's proposed tax plan is implemented as proposed, since the top tax bracket would then be reduced to 35% with many 35% high bracket taxpayers receiving a further reduction to 25% for income earned through a pass through entity. (2) I have significantly increased my allocation to short term CDs using a ladder strategy, since I am anticipating a persistent rise in short term rates. I will have short term CDs maturing every week. Most weeks will have multiple maturities. When proceeds are received, I have four primary options. I can buy more short term CDs, intermediate term bonds, exchange traded bonds and fixed coupon equity preferred stocks, and/or more Tennessee municipal bonds provided my buy target yields are hit for the bonds and preferred stocks. The secondary option would be to buy stocks which would require a substantial decline before I would meaningfully add to that category. I have significantly reduced the intermediate term basket over the past two months. Proceeds have been redirected to short term CDs and longer term, high quality Tennessee municipal bonds. For the Tennessee municipal bonds, I secure a double tax free current yield higher than the taxable yield in most of the intermediate term corporate bonds that have been sold. Tennessee does not tax earned income, but still have a tax on interest and dividend income that is being phased out gradually. It is possible that long term rates will fall if the FED persistently raises short term rates with inflation and inflation expectations remaining below normal trends. Starting with the 6/29/17 through 9/29/17, my net reduction in $1,000 par value corporate bonds is $91K. Some trades included in that amount will be discussed in the next two posts. During that period, there were several intermediate term bond buys that improved the current yield compared to the bonds that were sold. I have also knocked down significantly my exchange traded bond and fixed coupon preferred stocks. Proceeds from those sums have been directed in a similar manner, except that the proceeds from sales in my Vanguard account have been redirected into my Vanguard MM Prime Fund where I do not suffer much diminution in income and see no reason to buy low yielding CDs given that fund's yield. Both political tribes will continue to make roughly equal contributions to the fiscal train wreck that lies ahead. The methods used to cause budget deficits to explode differ in some ways, but the end result is the same. The similarities would involve wars of choice, like Vietnam and Iraq, that are financed with debt and have questionable relationships to national security. In the case of Vietnam, there was no legitimate national security reason IMO for U.S. involvement. National security problems probably increased due to the IRAQ war. Total U.S. debt was less than $1 trillion shortly before Reagan became President. And, to emphasize the obvious, that number was achieved only after 200 years. The U.S. government debt is now over 20 trillion. Debt to the Penny (Daily History Search Application) Interest on the national debt will exceed $1 trillion per year IMO at some point within 7 to 10 years. Government - Interest Expense on the Debt Outstanding It is just hard for me to even imagine the two political tribes doing anything other than accelerating the day of reckoning. The government revised its estimate for second quarter GDP up to 3.1% from 3%. News Release: Gross Domestic Product I am anticipating that the pace will slow in the current quarter due in part to the two hurricanes. That story was published on 2/9/17. The GOP has had years to come up with a detailed tax plan, but continues to flounder. It is easier for them to howl at the wind than to govern. Reagan was successful in working with Democrats on his tax package. Reagan was sworn in as President on 1/20/1981. The Economic Recovery Act of 1981 was signed into law by him on August 13, 1981. The comparison with the current GOP President, who has republican majorities in both houses of Congress, is striking. Tip O'Neill (D.MASS) was the Speaker of the House in 1981. Trump, on the other hand, does his best to antagonize anyone who is not a True Believer firmly entrenched in an alternate reality. The GOP still does not have a detailed plan, but only an outline of tax principles that has an abundance of gaps: GOP tax plan I found this document to be misleading which is to be expected. The GOP has at least thought about raising revenue in a tax package that substantially lowers the corporate tax rate. The problem with their two major ideas-ending the deductibility of state taxes and the border tax-is that those proposals increase individual taxes to pay in part for the cut in corporate taxes which does not sound like the best plan for willing elections. The GOP has apparently abandoned the border tax idea and is now going for now with eliminating the deduction for state taxes. I do not see how GOP congressman in states like New Jersey, California and New York could vote for a tax package that eliminates the deductibility of state and local taxes. Trump's State-Tax Plan Could Cause Headaches for 52 Republican Lawmakers- Bloomberg Residents from those three states and three others (Pennsylvania, Illinois, and Texas) claim more than half of that deduction. Some Trump voters who pay state and local taxes in high tax states will notice the end of their deductibility when their tax bill goes up even as their incomes remain relatively static. On a net basis, federal income tax liability would rise for millions under Trump's plan if state and local taxes can no longer be deducted. Increasing the standard deduction will not help those whose deductions under existing law would have exceeded the standard deduction as upwardly revised under the GOP's plan. That would include those who are able to deduct mortgage interest and state tax payments under existing law (plus charitable contributions, etc.). The increase in the standard deduction, which the GOP claims is a near doubling, would help retired folks who no longer itemize since the unrevised standard deduction already exceeds what can be now deducted in Schedule B and those whose standard deduction as revised would exceed what could have been deducted under current law. I would be an example of the former. My property taxes are low, around $2100 per year, and I own my home free and clear. Most of my charitable contributions will be made in my will. I have been a major beneficiary of every GOP tax cut starting with those in the 1981 law mentioned above. The alleged near doubling of the standard deduction will also reduce the revenues raised by eliminating the state/local tax deduction as more taxpayers will use the standard deduction rather than to itemize. It would also have a negative impact on growth in that it will remove for many the benefits of buying a home. The GOP is misleading the middle class voters-again-about the benefits of their plan to them. The plan consolidates exemptions into the increased standard deduction which is just another way of saying that the exemption amount is eliminated. The additional deduction for those over 65 would likewise be eliminated (the blind are entitled to an extra deduction as well). In addition, the 10% tax rate is raised to 12% as the GOP cuts the top rate to 35% from 39.6%. Trump tax plan: 'Doubled standard deduction' is misleading - Business Insider I give the GOP an A+ for subterfuge. Most of my grades for the GOP are A or higher in the subterfuge department. Lying works so well for that party since millions are so easily manipulated with false information. 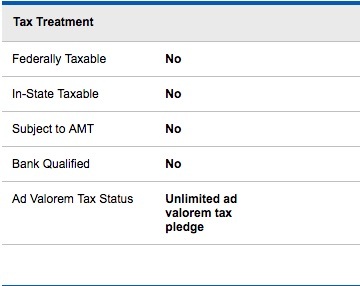 The GOP proposes to eliminate the AMT that has required Trump in the past to pay taxes. However, and this is a huge exception, the cap would be 25% for income received from pass through entities. That last reduction would effectively reduce the individual rate by another 10% for those in the new 35% tax bracket that use those vehicles to conduct their business such as Donald. I doubt that the further reduction to a 25% cap for the well to do will be widely understood, except by those who stand to benefit. Anyone in a higher than 25% bracket who receives income through pass through structures would benefit. A good example would be pass through entities created by professionals who provide services. Those businesses would include partnerships, sole proprietorships and SubChapter S corporations. The uber wealthy would also benefit by the elimination of the estate tax that only a tiny percentage now pay due to increases in the maximum deduction. The reduction in the corporate tax rate to 20% will benefit the top 20% since it is the top quintile where stock ownership is concentrated. Publicly traded corporations will use most of the extra cash to buy back stock, to increase the dividends, and to fund more generous management compensation. Dow Hits 21,000, Trump Touts Stock Market Success, But Many Left Out Of Gains : NPR (top 1% own 38% with the top 20% owning 92%); U.S. Stock Ownership Down Among All but Older, Higher-Income More than 1/2 of households own no individual stocks or stock funds. Notwithstanding the statement made by Trump a few days ago that the wealthy will not benefit, this proposal is primarily just another GOP tax break for the already rich and their corporate donors, with crumbs thrown to everyone else. The proposal would also accelerate the budget deficits and hasten the day of our nation's fiscal reckoning. The GOP knows that a tax plan can not be sold to most of their voters by admitting that the benefits are intended for, and will flow to the already wealthy, making them even wealthier. The plan will be sold by falsely portraying the actual meager or negative benefits to the middle class. Tax cuts for corporations will not have the same economic impact as lowering the individual tax burden for those currently in the second, third and fourth quintiles by an equivalent dollar amount IMO, thereby increasing their disposable personal income that would mostly be spent. The border tax idea would have also indirectly raised taxes on individuals by significantly raising the costs of imported goods, but the overall net negative impact on their finances might not be noticed by most Trump voters. Stocks, Bonds & Politics: Trump and the Upcoming Phenomenal Tax Cut: Economic Nirvana Just Around the Corner? Donald claimed yesterday that the GOP's tax plan was "not good for me". Trump enjoys lying IMO particularly when the lie so easily manipulates voters. Trump is lying about the impact of the GOP's tax plan on him. And his false representation could easily be proven to be a lie when and if Donald produces his tax returns which he will never voluntarily do. Trump also uses pass through entities which explains the new and favorable loophole being created for income received through them. And, in the unlikely event Trump falls into the highest tax bracket, the top rate would be reduced by 4.6%. Then there are the increase in dividends that could be reasonably expected from the lower corporate tax rates and the end to the inheritance tax. Maybe some Trump voters will tire of being manipulated and misled by Donald. Just as a reminder, when Congress lowered the tax on repatriated funds temporarily to 5.25%, about 92% of the $300+B brought back to the U.S. went to shareholders. National Bureau of Economic Research.pdf And this is the kicker. U.S. jobs were CUT during a period of economic expansion by the companies that brought back the most. Senate report says repatriation tax holiday failed to create jobs in US | TheHill (the 15 companies that repatriated the most cut 20K jobs from 2004-2007). What is generally known, even among republican politicians, is that publicly traded U.S. corporations will continue to hire employees and to build plant outside of the U.S. for reasons that have nothing to do with taxes, including but not limited to lower wages, lower or non-existence other compensation (e.g. employer retirement contributions, health insurance, worker's compensation, etc. ), and and far more liberal laws relating to the environment and worker safeguards. Ray Moore is a Theocrat who would substitute his personal religious beliefs for the Constitution and respect for the rule of law. “We’ve been deceived by a government that tells us we cannot worship God". I must have missed that government interference. When I leave my house and drive along Franklin Road for about 3 miles, I pass 7 churches that do seem to have a lot of activity. What does Ray really mean? The government so far has not allowed-yet-the evangelicals to turn public schools into Americanized madrassas where students memorize the bible and spend most of school hours reciting lines from memory as their heads bob up and down. I am not surprised that Bob Corker will not seek re-election. He is a sensible republican who is somewhat grounded in reality, a conservative in a party that is no longer a conservative one. There are several potential far right candidates who will be jockeying for this seat including several House representatives. The worst of the worst would be my representative Marsha Blackburn, a reactionary zealot. I used commission free trades round trip. WFCPRV is a non-cumulative equity preferred stock, issued by Wells Fargo, that pays qualified dividends based on a 6% coupon applied to a $25 par value. The issuer may call on or after 12/15/20 at par value plus accrued and unpaid dividends. The Stopper Clause, the means by which the preferred shareholder's superior claim to cash is enforced against the common shareholder, can be found at the bottom of page S-16 and top of page S-17. The price decline was due to the spike in interest rates that started in retrospect on May 3, 2013 and ended on 12/31/13. The ten year treasury went from a 1.66% yield on 5/2/13 to a 3.04% yield during that short period. Daily Treasury Yield Curve Rates for 2013 Sooner or later, there will be an interest spike that will keep on trucking beyond 3.04% to normal spreads to CPI and anticipated inflation. For the ten year the normal spread now would be close to a 4% nominal yield. A consider to repurchase price is below $24.5. ELC was sold to the public at $25 on 8/10/16 and has lost 15.2% of its value since that time to when I purchased today at $21.2. It took that much of a decline to give me slightly lower current yield to the two bonds that I lost in September 2016 to this issuer's early redemptions. I have been trading Entergy Louisiana first mortgage bonds since the 2008 fall. I currently own its First Mortgage bond, maturing in 2026, that has a $1K par value and a 2.4% coupon. I can hold that bond until maturity. I last discussed this bond in an August post: Stocks, Bonds & Politics: Item # 3.B. Sold 50 ELC at $24.77-Item #2.B. Added 50 ELC at $22.88 purchased on 4/13/17 (May 15, 2017 Post). Stocks, Bonds & Politics: Item # 1.B. Assuming no material change in the credit risk, I would consider buying back this lot at a total cost of less than 98. Any such buy at lower than 98 would also increase the YTM due to the larger discount and the shorter time to maturity. The same is true for the following First Mortgage bond. This is another bond that I would consider buying back at less than a 98 total cost. In Item 1.A. to the previously linked post, I discuss buying in another Roth IRA account 1 ERP SU bond maturing in 2026 which I still own. Stocks, Bonds & Politics: Item # 1.D. I am targeting a possible repurchase at less than 90. Stocks, Bonds & Politics: Item 1.A. My target repurchase is currently at less than 95. I bought on the ex dividend day. Dividends are paid monthly at a variable rate. This ETF is primarily a play on rising short term rates. These loans will generally use the 3 month Libor rate, paying a coupon at a spread to Libor. There may be an issue when Libor rates are no longer being quoted which is expected by 2021. I have not seen the loan documents to determine whether alternative rates will be used. Many of these loans will mature prior to that time. 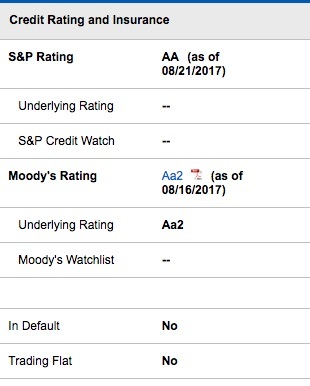 The weighted average maturity of the senior loans owned by this fund was 5.3 years as of 9/14/17. I am starting to cluster more maturities in December 2017 in case there is another .25% hike in the FF rate that month. The Bank of China and Bank of India CDs are issued by their respective U.S. bank and are FDIC insured deposits. Just raising cash here in my IRA account hoping to buy bonds with higher YTMs before yearend. 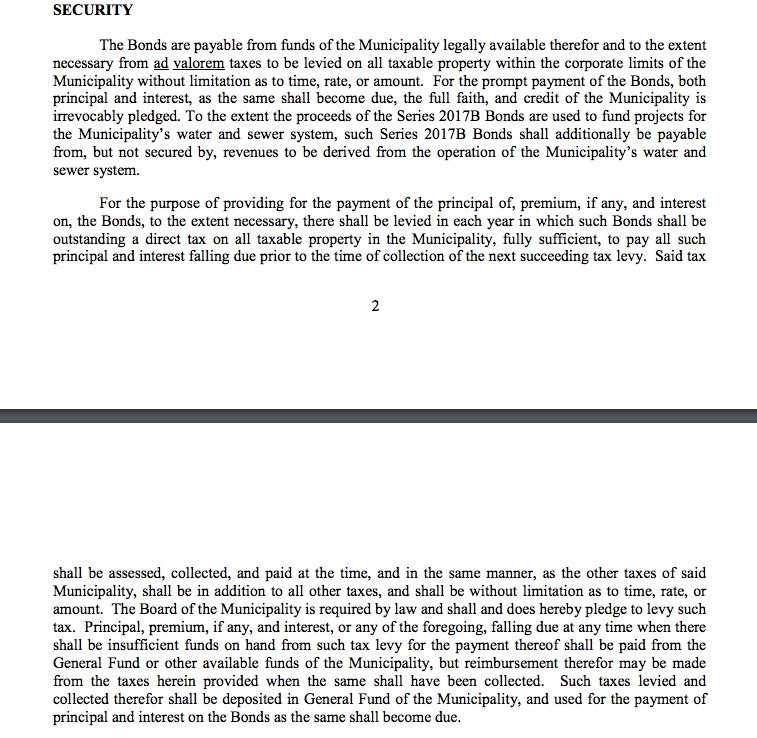 This bond is a Series B bond secured by ad valorem property taxes and will also be payable "from, but not secured by, revenues from the operation of the Municipality's water and sewer system" to the extent the proceeds are used fund those projects.